I'm a huge fan of BTS and have been since their debut, although my love for them grew even more with N.O last year. The entire mini album was very promising and full of hidden gems, so my expectations for this comeback were high and hopeful. This music video, however, has me somewhat conflicted. The whole school situation seems to be BTS' thing, with both of their previous title songs having a theme circulating around it, but not in a very positive way. They talk about going after your dreams, and how school can be oppressing and prevent you from doing so. They discuss issues that a lot of Korean scholars can relate to and identify with, and I know that the members are very active in the making of their own material as well. 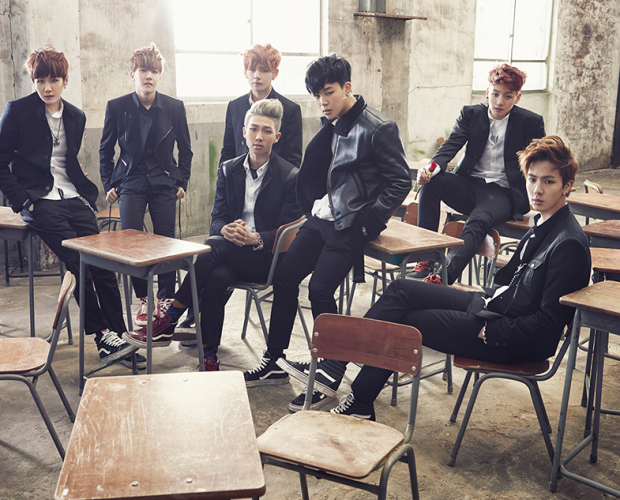 Boy In Luv is not about school, at least not any further than the video taking place in one. Instead, as the title gives away, it's about being in love. However, the love is a bit complicated, to say the least. The plot is quite simple, but at the same time very confusing. Maknae Jungkook (he's really young and by that I mean a year younger than me which is unusual) sits in class and does his work diligently when he spots a pretty girl walking past outside the classroom. Is it just me or did you totally see the resemblance to BtoB's Ilhoon? His girl persona looks just like that girl. Anyway, she continues her stride through the corridors, and gets noticed by Rap Monster and Suga. We also see Jimin cleaning the bathroom, J-Hope and V being lazy and Jin listening to music inside a locker. Yeah, I know, that's clearly the best place to do so. The members gather in an empty classroom, brought together by Rap Monster sending out a message via the school radio system, throw some chairs around and Jin goes to get the girl. It's rather violent actually, as he pushes her up against a locker and grabs her forcefully by the wrist. He pulls her back to the classroom and she does not look very happy, which I can understand because that violence is just uncalled for. Jungkook then confesses to her and gives her a rose which she happily accepts, but the roles switch and we see both Jin and Jimin in the same position. It could be because it's their lines that's playing but it sort of messes up the plot. 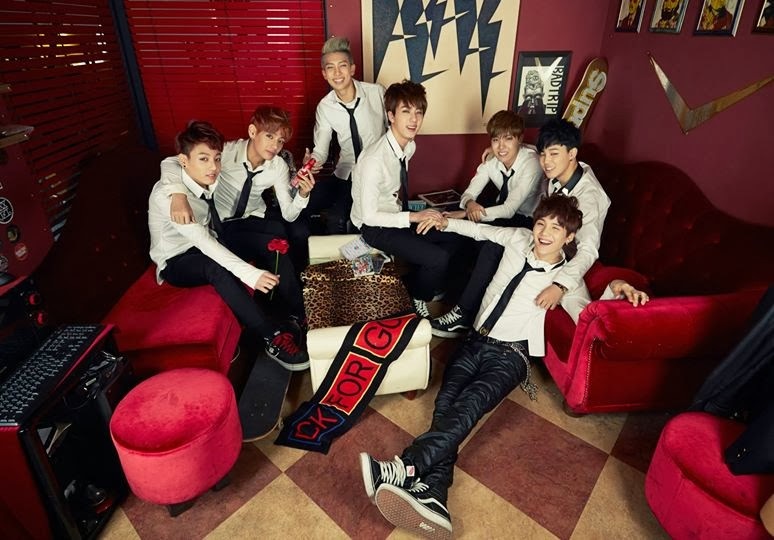 The video ends with Suga sitting on a basketball hoop and all the members including the girl partying together. Although there are some minor things that are kind of strange, the one thing that bothered me the most was the violence against the love interest. Sure, the lyrics sort of explain it in a way; he feels frustrated that he's so in love with her he's acting childish and immature and is a bit mad that she doesn't seem to respond to him the way he wants. Nevertheless, I really don't think it justifies any actions at all, and it throws me off because I know that it's supposed to be seen as masculine and romantic. "He's so in love he can't control himself", "The girl causes him to treat her like that because she rejects him" are just a few examples of excuses that all glorify this kind of behavior. The scene were Suga is all up in her face, trying to get close to her in an almost borderline abusive way upsets me, and you can see her disinterest as she pushes him away repeatedly. Jin is really rough with her too, but I heard that they all apologized on their showcase for these actions (thank God) so it's good to know they still have some decency in real life at least. What makes it even more strange is the ending, because then apparently everything is fine and cheerful. Like, how did this happen? She was obviously upset and repellent before, why would she suddenly change her mind because of a confession? It's annoying because the set-up for the plot is not actually bad at all- the idea of Jungkook falling in love in school and the rest of the members help him setting up a location and bring the girl to him for a confession. I understand that to match the lyrics, the video had to be a bit on the rougher side, and while I like that, there's no reason to be violent and aggressive towards her. I would much rather have them kick those chairs and take that lovesick frustration out on inanimate objects. The tone of the video is rough, dark and aggressive, all taking place in a school building. The color chart and lightning remind me of EXO's Growl, and so do the school uniform outfits. I do find the cinematography and scenery great though, and the lack of color sets the vibe really well. It all goes hand in hand with the rougher concept they're going for, being all black, gray and white. This makes all the member's hair colors pop out, especially V and his orange locks. Speaking of hair colors, I don't really have any complaints about any of them, even Rap Monster's blonde do looks quite decent. The outfits are pure heaven though, the fitted jackets, white shirts and various ties work like magic. I seriously don't think there's anything more attractive than a guy working a suit or uniform of some sort, which this video has plenty of. One thing to always anticipate with BTS is their choreography, which has been incredibly consistent and utterly impeccable from the very beginning. If you've seen their dance practice videos, you know what I mean; these boys work hard to perfect their moves and synchronization, and it pays off beautifully. Even non-skillful dancers like Jin and Rap Monster are always on par with everyone else, while not technically gifted, they still are able to keep up and perform without sticking out in a bad way. This is most certainly another solid comeback for BTS, and can I just say real quick how much I love the song? It's probably their best title track to date, in my opinion. The video has its good and bad points, the most negative one being the somewhat confusing plot and the positive ones being everything else. However, that scene with Jungkook and Jimin in the bathroom is hilarious and will definitely be replayed more than once.